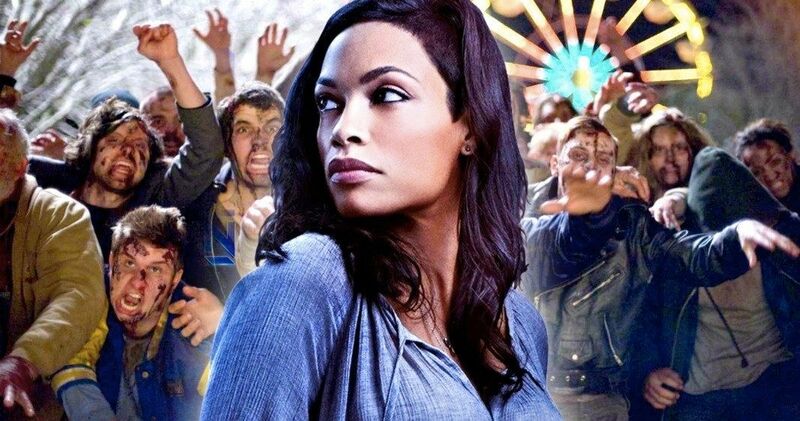 Rosario Dawson has officially joined the long-awaited Zombieland 2, set to hit theaters this October. The follow-up to the beloved 2009 post-apocalyptic comedy will rejoin us with the four original characters: Wichita (Emma Stone), Little Rock (Abigail Breslin), Tallahassee (Woody Harrelson), and Columbus (Jesse Eisenberg), as they trek across the American heartland battling all new types of dangers. It’s unclear as to exactly what role Dawson is playing but she is also joining other newcomers Zoey Deutch and Avan Jogia, so there will be plenty of interesting new characters – not to mention zombies. The success of Zombieland blew everybody’s exceptions out of the water. It was cleverly released during the prime seasons of AMC’s The Walking Dead, so zombie fans were already frothing at the mouth for more, and Zombieland was the perfect detour for them. Following a ragtag team of characters, the film took us across a zombie-ridden America where there was endless mayhem and violence, and yet still plenty of fun. The film has since become quite a cult classic, and so it’s no surprise a sequel is finally being made. And having the original team as well as a number of newcomers, such as Dawson, is hopefully a surety for success. Over the last few years, Dawson has struck comic book gold by appearing in five of Netflix’s Marvel series: Jessica Jones, Daredevil, Luke Cage, The Defenders and Iron Fist. Obviously she has been keeping herself pretty busy, not to mention growing a wider and wider fanbase. Aside from her many appearances in the Marvel shows, she’s also well-known for her powerhouse performance in Robert Rodriguez’s Sin City back in 2005. She definitely can carry her own in any action setting, which Zombieland 2 will almost surely be. We still haven’t seen too much about the sequel as of yet. But any zombie comedy will still undoubtedly be a welcome change of pace to most audiences considering the wave of superhero movies released over the recent years. Because even though it is a sequel, it’s hard not to love what the original Zombieland created. It made a stamp on the genre by playing as a grounded yet still emotional zombie film with a set of characters we all could relate to, so the sequel is definitely one to look out for later this year. Zombieland 2 hits theaters on October 11th. This news comes from Deadline.